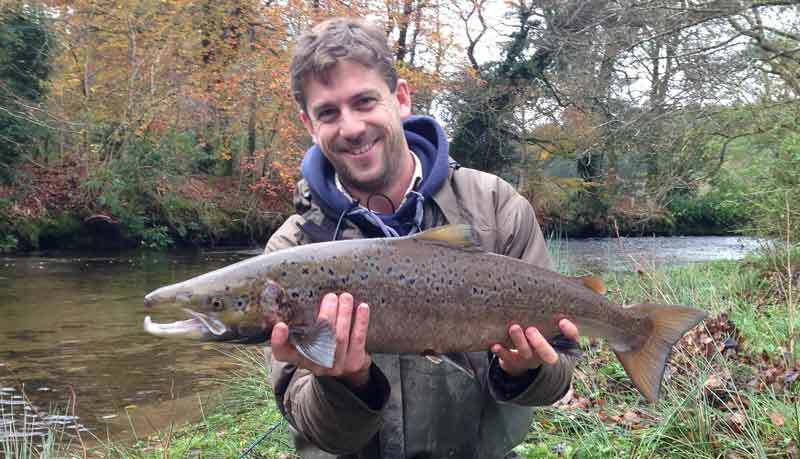 Salmon Fishing in Cornwall - My first experience, and it's a good one! One of the wonderful things about fishing in Cornwall and anywhere in the world, is that there are some many different experiences that can be enjoyed. Some people specialise in catching one particular species of fish and become experts at at. For some freshwater anglers in the UK that might be targetting large Carp or for the sea anglers it could be big Bass. But me, I want to try and catch everything! That comes at a cost though, I’m not a master of any one species but throughout the course of any year I’ll look forward to catching Tench of just a few pounds as much as I do cacthing big Blue Sharks from my little boat, a jack of all trades! 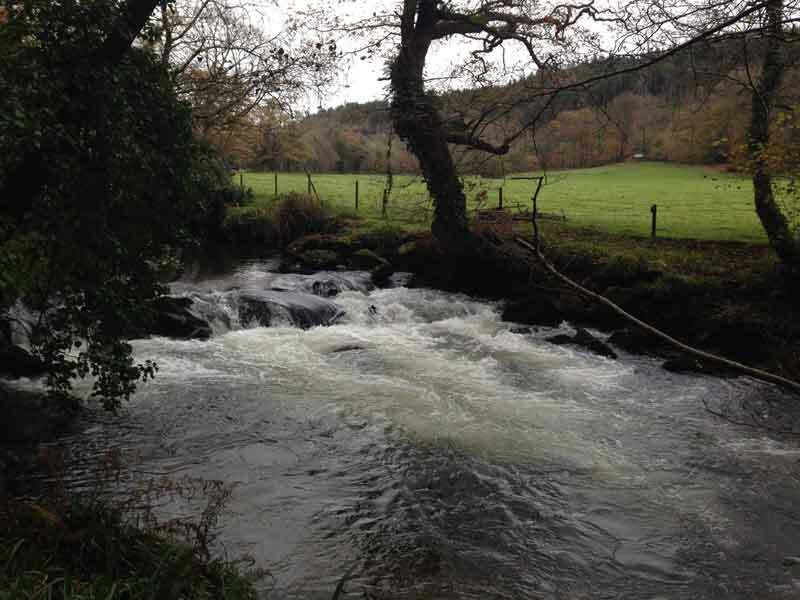 Could I add Salmon fishing in Cornwall to my skills? Despite this ambition to catch anything with fins, one fish that has been right under my nose for many years but I couldn’t see a way of ever catching one was that most incredible of fish, the wild Atlantic Salmon. Most commonly associated with the big rivers of Scotland like the Tweed and the Spey, Salmon are the stuff of dreams. The fish starts its life hatching in small river tributaries where it lives its young life. Then something miraculous happens, the Salmon stops looking upstream and instead it turns and goes with the flow, downstream all the way to Atlantic Ocean. It might stay there for a year it might stay for several but whilst it is an ocean going fish the Salmon eats protein rich sandeels growing big and strong. Next comes the next miracle, the Salmon turns and heads home, and not just home to Europe, or the UK or even Scotland, but home to the very river and even the very tributary it was born in. How? We really don’t know. And that’s one of those wonderful mysteries of the natural world that the scientist in me would love to understand, but the romantic in me would quite like to remain a beautiful mystery. When the Salmon reaches home after leaping up weirs and seemingly unpassable white water, it will spawn and start the cycle all over again. It’s quite likely that this spawning will be the very last thing it does. It’s just incredible. Just recently we managed to get a date in the diary for a couple of hours on the river. The chance of catching a Salmon from a river that isn’t exactly renowned for its Salmon was I thought pretty damn low, but just the chance to walk and wade along the river in a rather private bit of countryside was a chance I would never pass up. Now i should explain that whilst I am a jack of all trades when it comes to fishing, fly fishing is my least practised trade. I can make a reasonable cast but I’m more used to ripping big sandeel lures through the air in search of bass from a windy boat than I am delicatly dropping a flu between the trees to cover a small Salmon lie. I was a little nervous about showing myself up I must admit. Fortunately, my casting arm and eye was in that morning and the casts quite quickly starting to fall or roll nicely into position and a few confidence boasting words from my guide for the morning suggested I was at least presenting a half decent fly to whatever might be in the river. 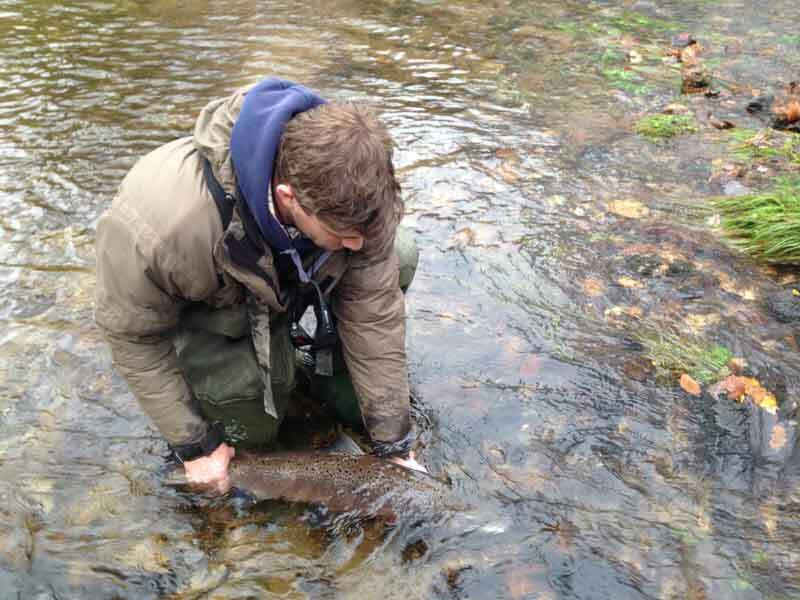 We fished a couple of pools, the first was simply to get the casting flowing and the second offered a slightly better chance but other than a couple of pulls from a small Brown Trout nothing stirred. On to the next pool where Alan, my generous guide suggested often held a fish or two. The cast for this one was fairly simple, just a simple roll dodging the overhanging trees and as close to the far bank and into the deep water as possible. The first few casts I could feel weren’t right, the line was whipping across the current and the fly wasn’t fishing properly. However with a little more concentration and effort a cast dropped that fely about right. Another cast followed and again it felt right. As the little black and silver tube fly swung across the flow as the line tightened, BANG!! I don’t know how many fish I have hooked in my life but there are still times where I stare in absolute disbelief at the situation, how on earth is there actually a fish on here?! The fish lept from the water just like I’ve seen on TV and as it crashed back to the water the line fell slack, ARGH! I shouted, but stripping the line quickly I found the fish was still on. Keeping the line tight as time and time again the fish cleared the water and nearly cleared the river bank at one stage, was very hard. Eventually I got the line back on the reel and could play it with a little more control from there. Several times the fish nearly made it out of the bottom of the pool and into the next run of white water which would have meant chasing it. My knees were knocking like I haven’t felt for years, I don’t think i could have run after that fish if I’d tried. Eventually the runs started to slow but still it twisted and turned making heart stopping head shakes. After 10 minutes I really wanted to just net the thing, I had enough, I’d had my fun, now let’s end this and we can all smile then I’ll put you back. It was another five minutes before the fish finally headed for the nearside bank where Alan, sensing my panic lept in and made a swipe with the net and got him first time. Honestly, I’ve not felt like that whenfishing for many years, not since the first Blue Shark I landed from my little 14ft boat on my own. The hook was quickly removed before a very quick photo and then a long recovery in the water. It was nearly 10 minutes before the strength was back in that fish but he swam off strongly, back into the pool to probably sulk and then think about finding a lady and finishing off his incredible journey. It really was a sensational experience helped by a generous friend and a big slice of lady luck. If you get the chance to try something new, grab it with both hands and don’t be afraid to acceot a little help from a friend. Good luck!